Preferred supplier to assist CIF members in successful ISO 9001 Certification (Quality), ISO 14001 (Environmental) and ISO 45001 (Health and Safety) or Safe T Cert. CG Business Consulting have been identified as the lead consultant for implementing Quality, Environmental and Health & Safety Systems for the Construction Industry Federation. Why ISO is important for Construction? Today ISO certification is a primary requirement for competing in some Pre-Qualification Questionnaires and Invitation to Tenders. ISO 9001 gives assurance to work partners that you work in a structured and controlled manner. The company can implement processes to evaluate their sub-contractors on a continual basis and ensure control is effectively managed. SAFE T Cert/ OHSAS 18001/ ISO 45001 Health & Safety Management will create a safer workplace for staff, contractors and visitors. ISO 14000 Environmental Management will reduce costs while caring for the environment. 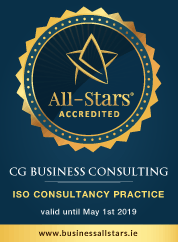 CG Business Consulting has a 100% success rate in IS certification. Talk to us now!